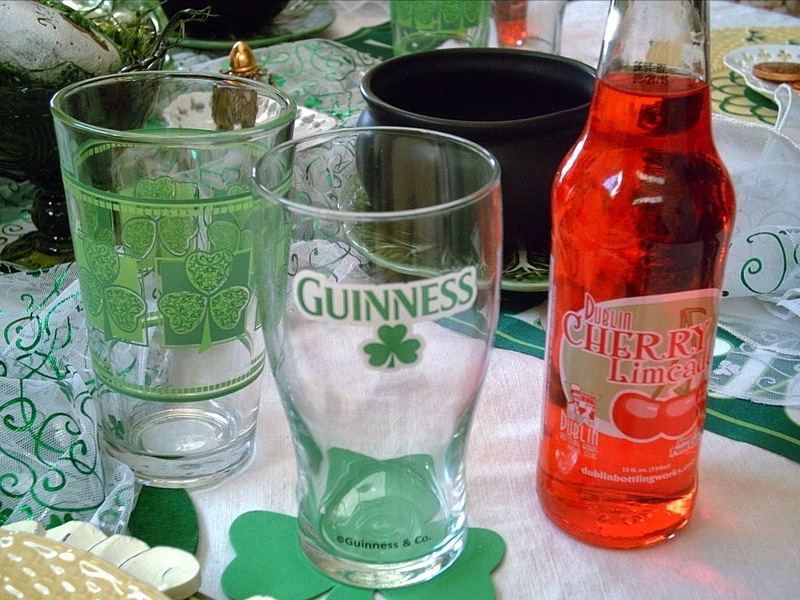 I have always celebrated St Patrick's Day, as my Dad's family is from clan Guinness. Patrick McGuinness. You can't get more Irish than that. Right! My Danish mother would always fix a wonderful meal. 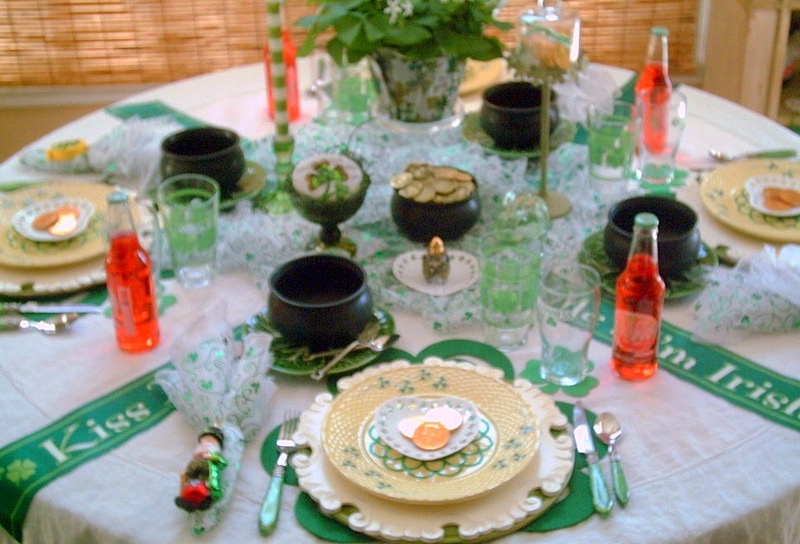 We most times had corned beef, cabbage, red "new" potatoes, & Irish soda bread. With some over the top dessert. We were always told, the tradition of corned beef is mostly an Irish American tradition. 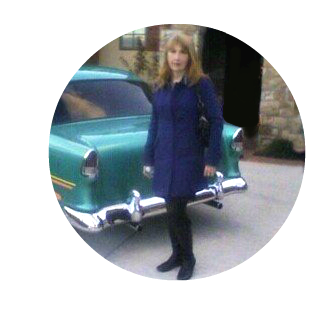 If you click on the photo it will enlarge for more details. Please Feel Free to Leave a Comment Below. 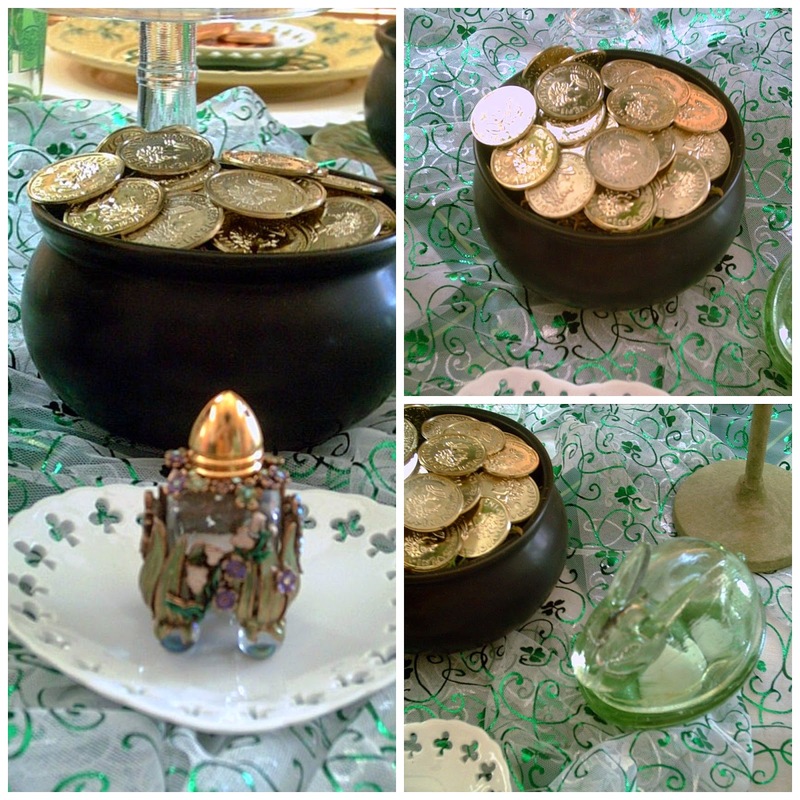 Not only is there a pot of gold included in the centerpiece but each place setting has a pot or cauldron. Maybe you will remember these cute cauldrons. Sold at Crate and Barrel for Halloween. They make a great St. Patrick's Day Pot of Gold. 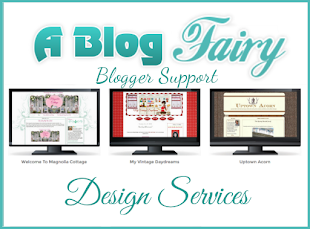 I will be serving a yummy creamy, creamy potato leek soup. I had to include tools to dig for your gold, as a lot of Irishmen were miners. 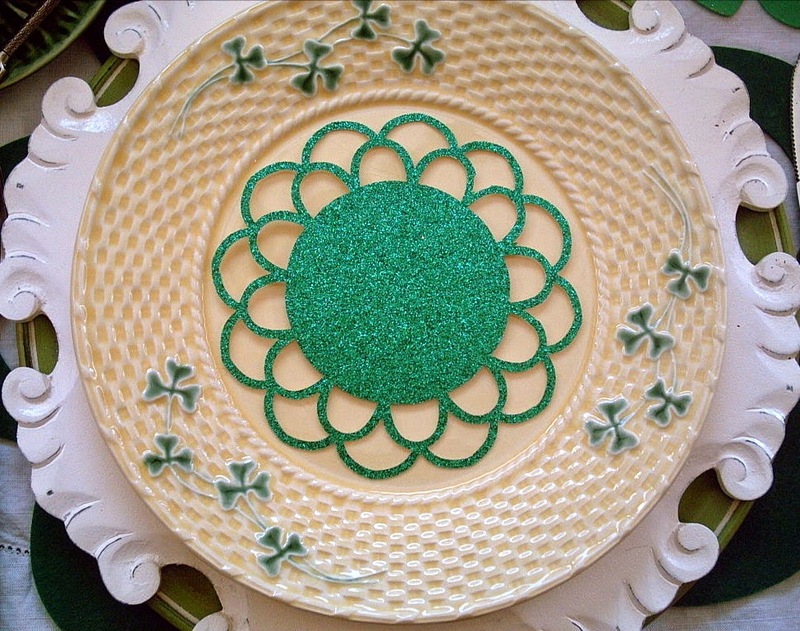 Mining in the "old country" as well as the U.S..
Underneath the little heart shamrock plate I placed a green glittered doily I made with my Martha Stewart circle cutter. For napkin rings I used ornaments. They were sold at World Market at Christmas in their "Around the World" Ornament sets. They did several countries. I purchased the Ireland ornaments knowing I would use them for napkin rings. 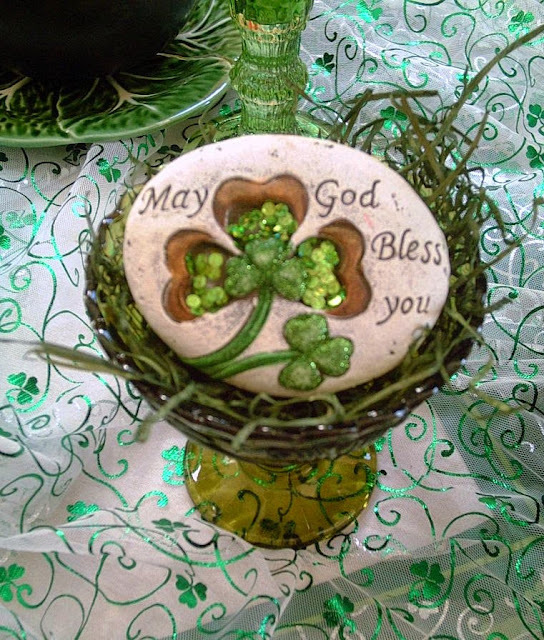 My little Blarney stone from the dollar store. I had to get the Guinness glasses with the shamrock's as it is a family name. The soda is called "Dublin" cherry limeade. Please feel free to leave a comment! Thank you for looking. 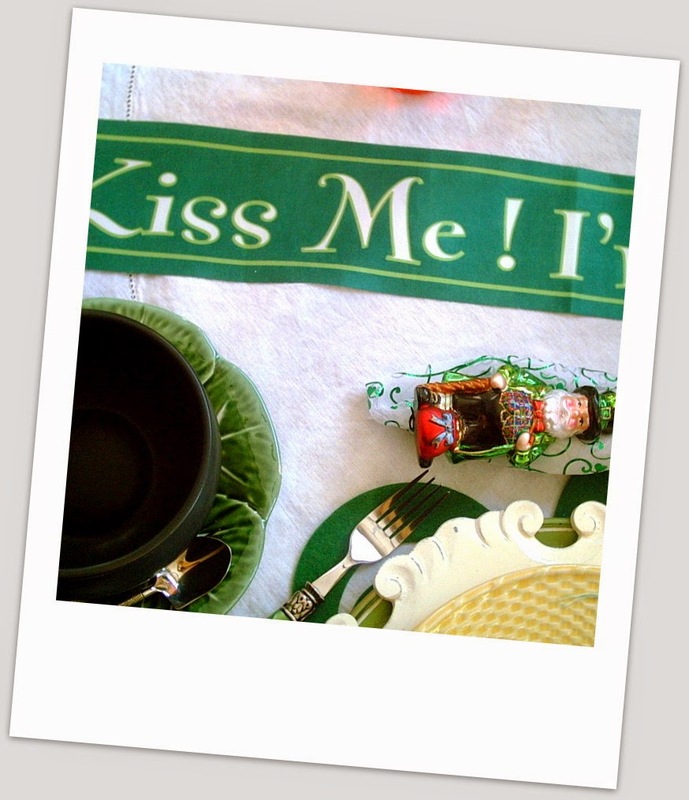 I will be posting this at Between Naps on the Porch for Tablescape Thursday and with Cuisine Kathleen's 7th Annual St. Patrick's Day Blog Crawl. Items that I used on this Tablescape came from so many sources too long to list. 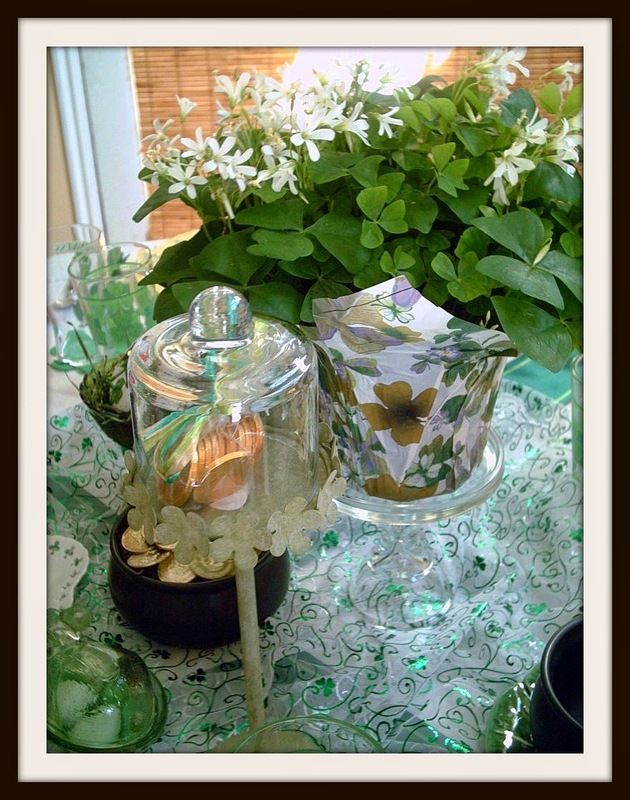 I'm participating in Tablescape Thursday at Between Naps On The Porch. And check out Cuisine Kathleen's 7th Annual St. Patrick's Day Blog Crawl here. 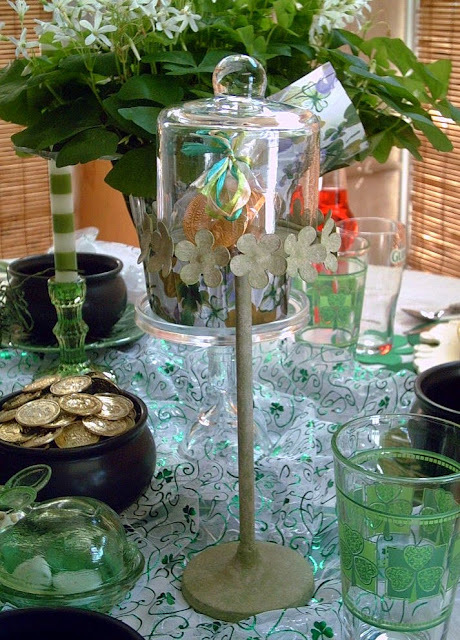 Lovely table with all of your Irish dishes and accessories. Very cute little soup bowls and the centerpiece is awesome. 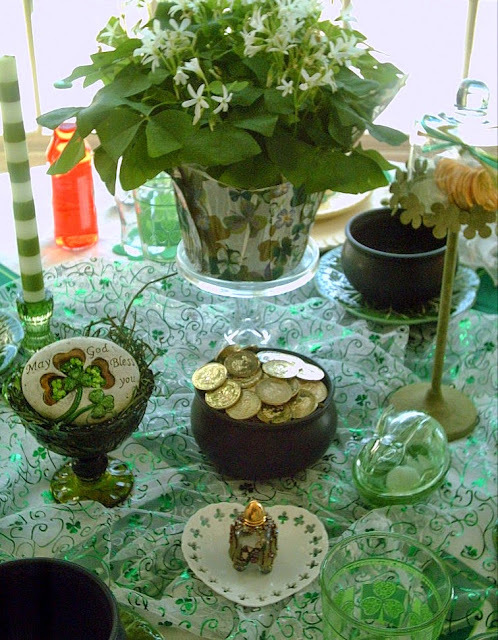 A proud table to celebrate your Irish heritage. 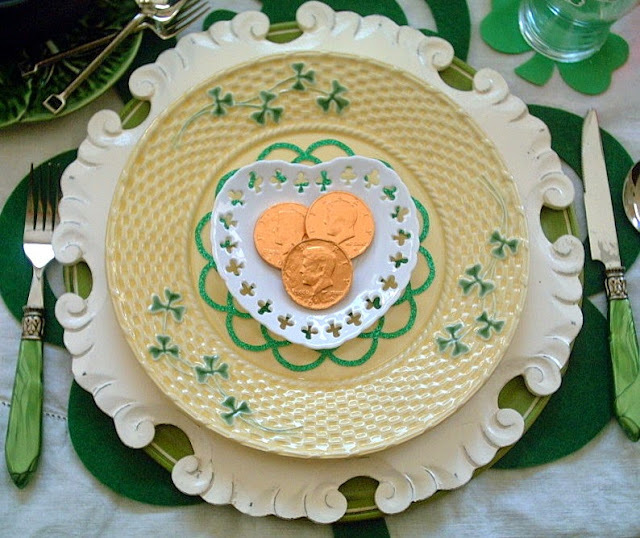 Love your little pots o' gold, and the pretty plates! 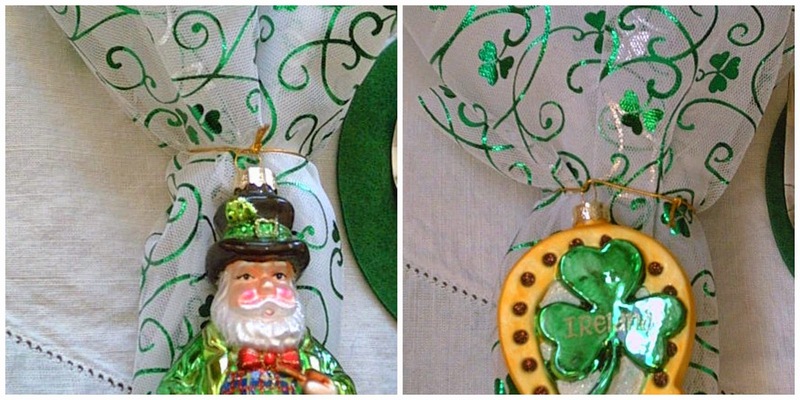 So happy to have you link to my St. Patrick's Day Crawl! I love your table the yellow plate is so pretty! I don't know if I have ever been here before, hope you will join in the monthly challenge at my place! Happy SPD! I love the fabric for the napkins and runner. It's beautiful, and your plate stack is so pretty. The fork and spoon are so cute. Love the idea of the H'ween pots for St Patrick's - very clever - also the use of the pretty ornaments as napkin rings. What fun St. Pat's trinkets you have. Love those plates and chargers! Valerie your Saint Patrick's Day table is delightful. The clever napkins and the ornament napkin rings are lovely. I love the shamrock plates, that hue of yellow and the green look wonderful together. 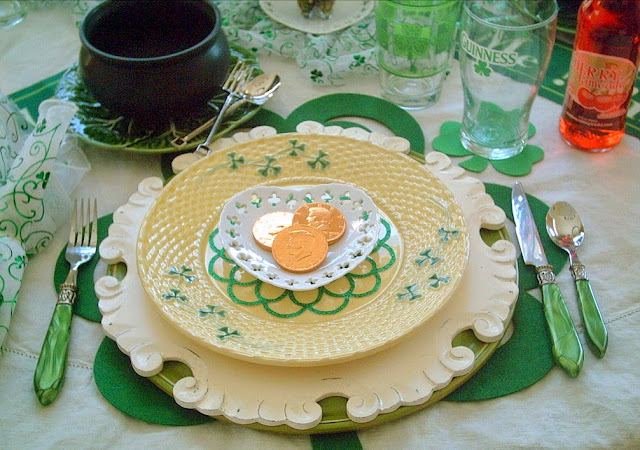 I will be using my shamrock plates when my sons come for dinner on Sunday. Love the pots of gold and attention to detail. Cute, creative table! Love the shamrock plates. 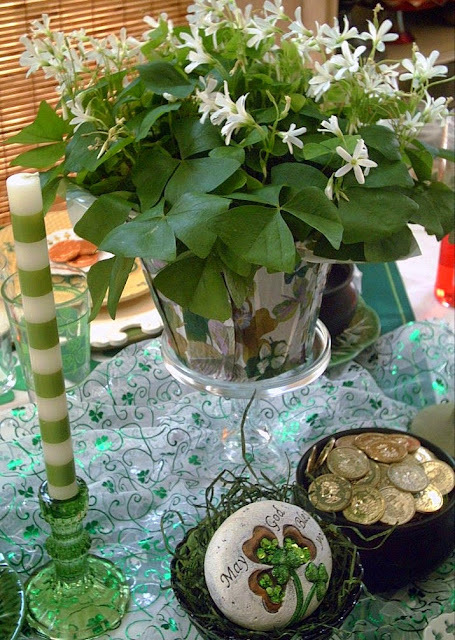 I like so many elements of your table like the little black cauldrons for the pots of gold! Love the dishes p, glassware and the shamrock plant. I just read about the corned beef being an American tradition. I'm going to try a recipe in the slow cooker this year. That was a good idea with the ornaments for napkin rings! Wishing you a Happy St. Patrick's Day! Very festive SPD table, Valerie. 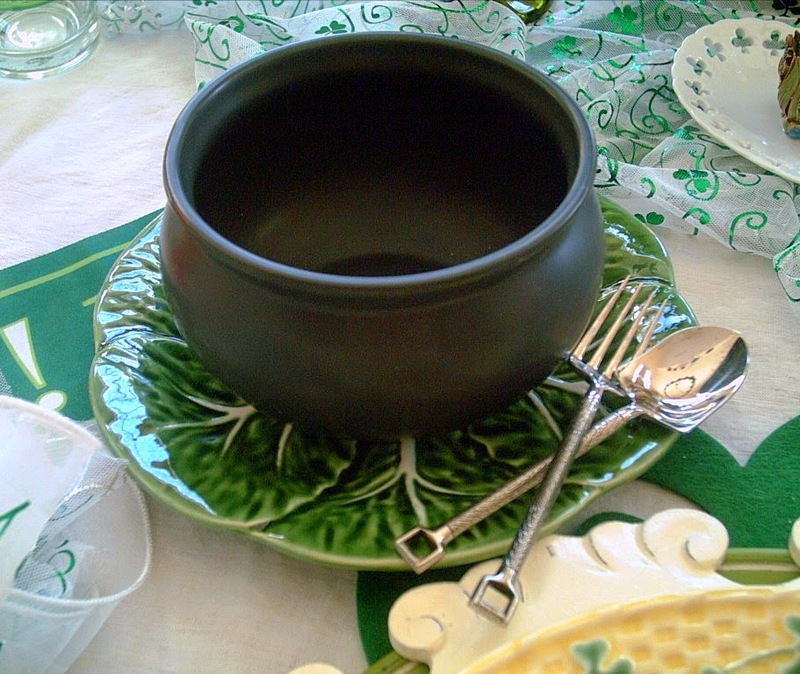 I love the shamrock plates...how cool to use the black cauldrons for soup. I love this table, my favorite color is green. And those doilies are gorgeous! I'm trying to wrap my mind around your mad skills. I love your style, keep up the good work! Good post with all of your Irish pieces. Love the black pots of gold and the dishes and glassware are perfect. 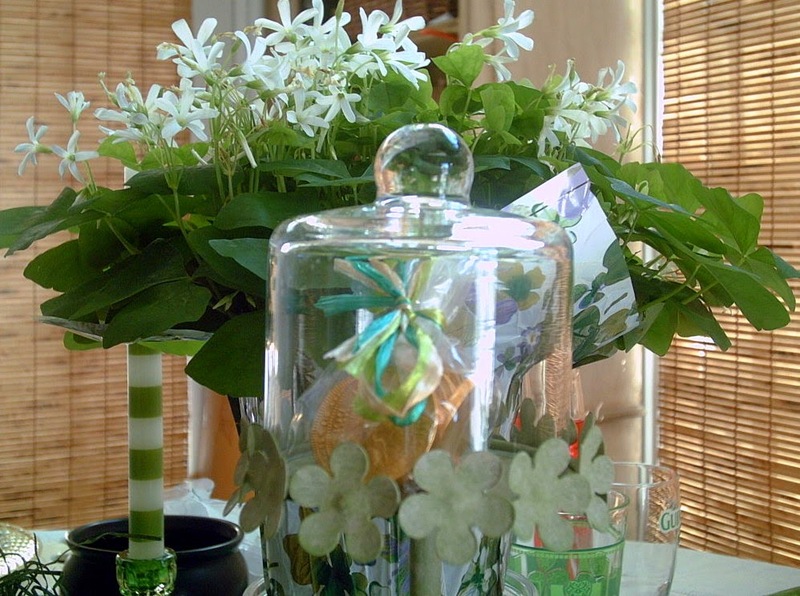 I'm going to look for a shamrock plant this weekend.